Last month my blog completed 9 years of existence in the blogosphere. Nine. Whole. Years! I don’t know where the years have flown by and it suddenly makes me feel very old. To celebrate this occasion I made some cupcakes. Just kidding! I generally make cupcakes when my kids demand them from me. 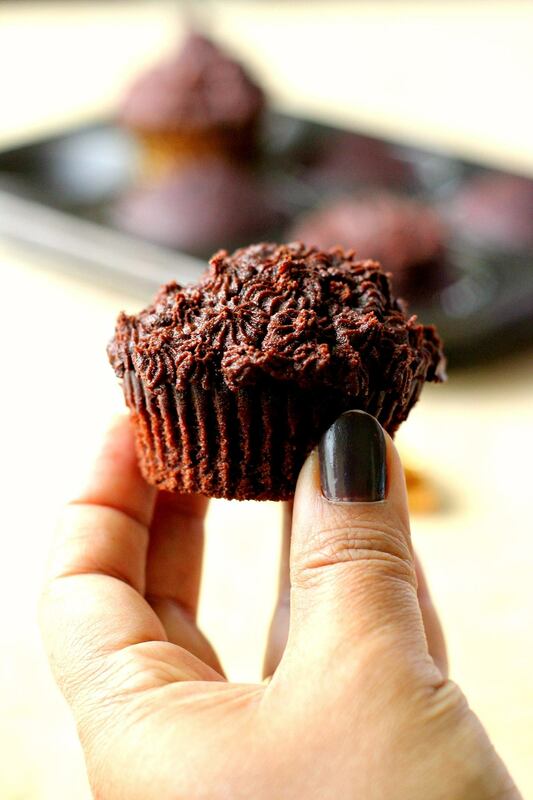 I have tried this recipe like a zillion times and topped the cupcakes with this amazing chocolate fudge frosting (the recipe of which I will share next). My kids love this indulgence occasionally although I don’t bake too often these days. The primary reason is that I am trying to watch my weight and baking just puts me into an eating frenzy, because, well, who can resist a batch of warm, fresh, home-baked goodies? I am also a self-confessed chocoholic. I just cannot resist chocolates in any form. I experience sheer bliss when I eat them and these cupcakes were no exception. They are ultra moist & fluffy to begin with. Plus they are chocolate. Plus they have a mind blowing frosting that you just cannot resist. I never manage to get pictures of these cupcakes as they get over in minutes. This time I made sure I hid some for the photoshoot. 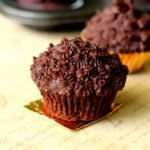 I really really hope you give this recipe a try, especially if you are a chocoholic like me! Here are some of my celebratory post of the yesteryears! Save this recipe on Pinterest and do follow me there! 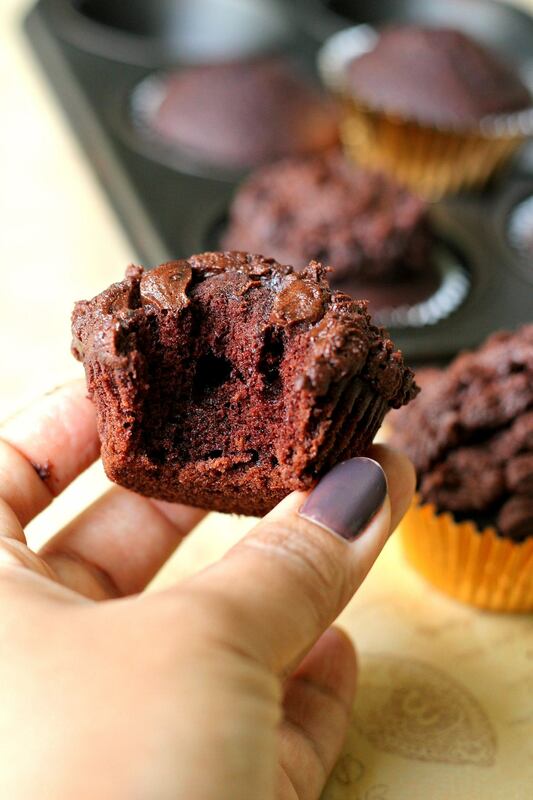 These ultra-moist & fluffy, Oh-so-chocolately cupcakes are a must try for every chocoholic!! Put the butter & sugar in a large mixing bowl. Sift in the flour, cocoa powder, baking soda and the salt. Add the eggs. Whisk everything well using an electric whisk. Add the sour cream or the hung curd mixture and mix everything gently using a spatula. 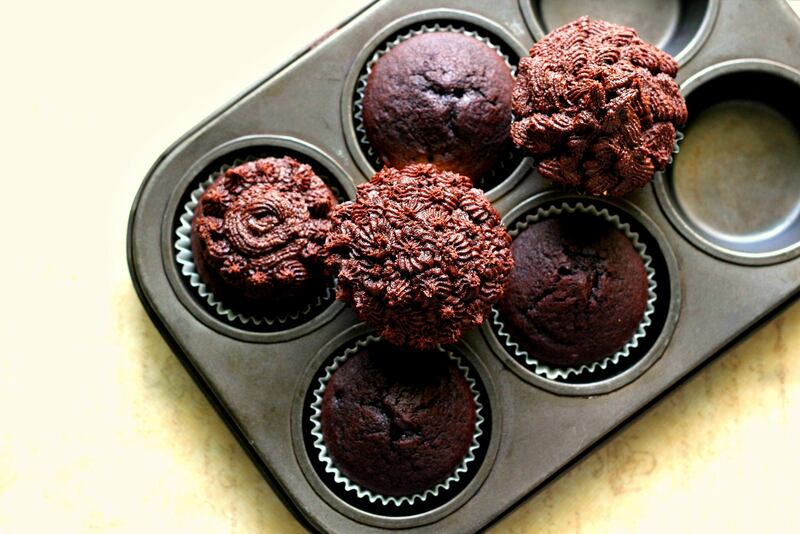 Divide the mixture equally between all the cupcake liners and gently tap the tray to release any air bubbles. Bake in the preheated oven for 15-17 minutes or till the skewer inserted comes out clean (my cupcakes took exactly 15 mins). Remove the tray and place on a wire rack to cool for about 10 minutes before removing the cupcakes. Let the cupcakes cool completely before frosting/icing them. Soft brown sugar gives a nice colour and flavour and if you do use it, make sure to break any lumps before you begin. If you don't have it you can simply use caster sugar. Demerara (granulated brown sugar) may also be used but you can pulse it in the mixie to give it a finer texture. If you don't have sour cream simple use a combination of hung curd and fresh cream. To make hung curd at home, just take 1 cup (250ml cup) thick yoghurt (curds) and place it in a thin muslin cloth. Tie up the loose ends and hang this bundle over your kitchen sink to allow the whey to drip off. You can also place the yoghurt in a fine mesh tea strainer instead of a muslin cloth. After about 45-50 minutes you will get thick, creamy curd. Add 3 teaspoons of fresh cream and mix well. Measure out 150 grams of this mixture and use it in the place of sour cream. Thanks so much Rafee! Yeah! 9 years just flew by although they seem a lot now 🙂 Good luck for you to reach this milestone soon! Can we have the frosting recipe as well please! Sure! I’ll be posting it soon! The cupcakes look amazing. Cannot wait to try them. I have some eggless baking to do, Any suggestions on how to turn this recipie on It an eggless one, please. These cupcakes are looking heavenly. Sorry for the late response! Honestly, I never like measuring in cups as I am more comfortable with the weighing scale as it is more accurate. I will update the recipe with the cup measures soon! 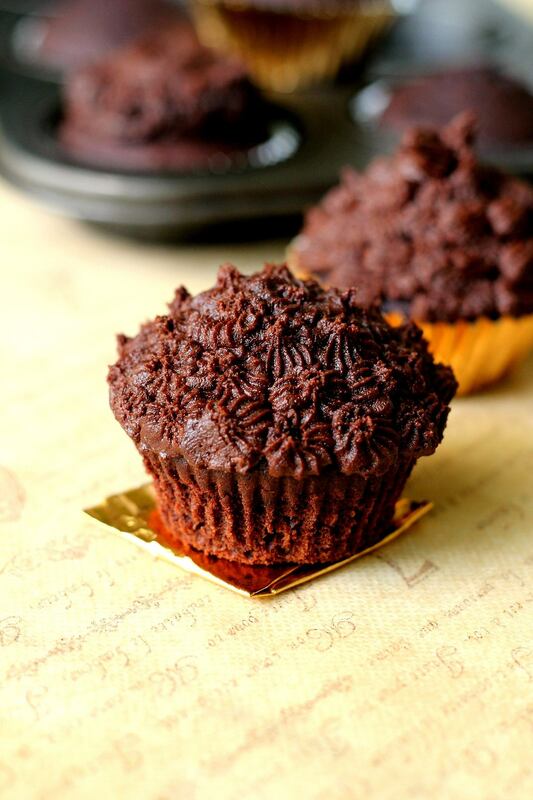 This scrumptious cupcake deserves a 5-star rating. 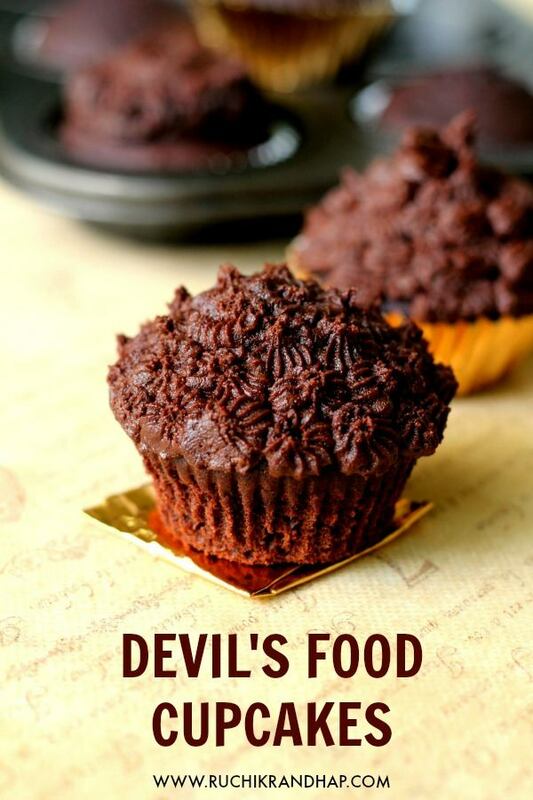 It’s indeed a delectable cupcake to satisfy anyone’s taste buds.